Last week, I participated in two discussions about the changes in the SaaS world. I believe they are fundamental. The most important force shaping the industry today is competition. The level of competition in many core SaaS segments is intense. Why? The SaaS era is about 20 years old. Salesforce was founded in 1999. Since then, many major categories of software have been saasified. Venture capitalists have financed many of those businesses. 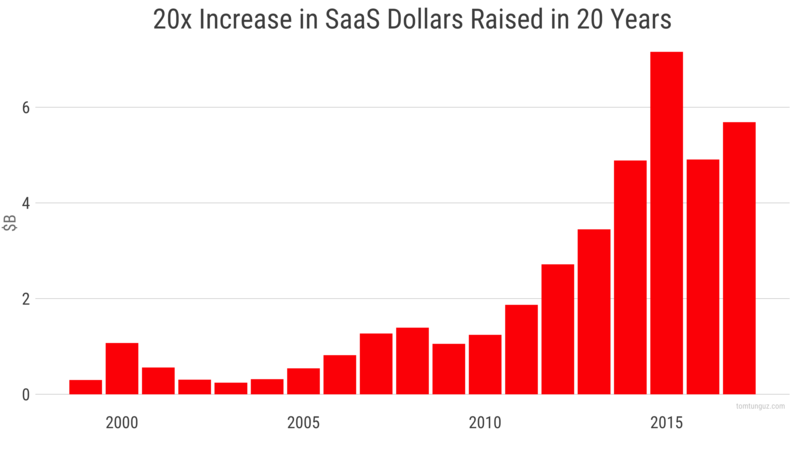 Over that 20 year period, annual SaaS investment has increased 20x, peaking in 2014 at $7B. Those venture dollars have financed a panoply of competition. 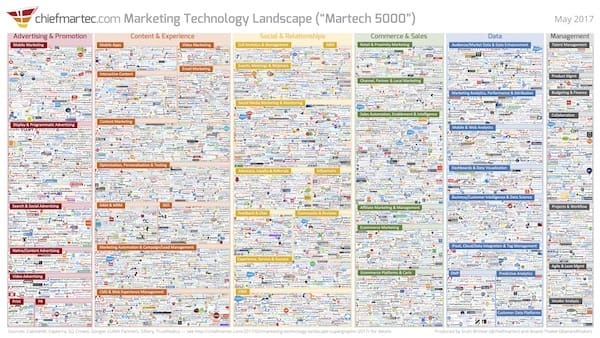 In 2012 ChiefMartec landscape counted 350 vendors selling to sales and marketing. Today, that figure is 5000. The landscape is so vast - and the logos so minuscule - that it’s useful only as an illustration of competition. 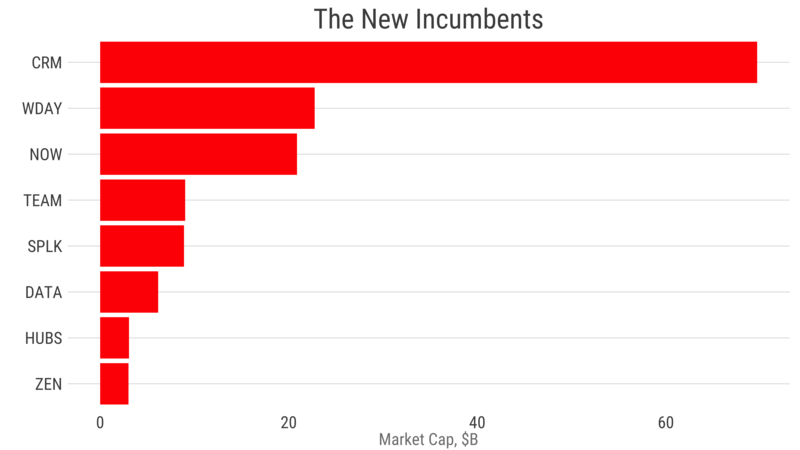 This sea of SaaS startups have reshaped the market. Incumbent client/server technologies have lost their market dominance to new incumbents. The chart above shows them by buyer. Salesforce for Sales, Workday for HR & Finance, ServiceNow for Operations, Atlassian for Engineering and so on. In addition, the playbook is known. Thousands if not tens of thousands of pages have been written about the marketer, sales developer, inside account executive and customer success play. Most businesses are competing with the same strategies as their competition. Verticalization - compete with a horizontal player by picking one customer segment and building a product better suited to them. Trades market size for better product market fit. Segmentation - focus on SMB, Mid-Market, or Enterprise, to play where competition isn’t present. Feature optimization - develop a product with 20% of the features but 80% of the value, and use a simplified product to challenge the competition. Opting out of starting a company - deciding the timing isn’t right because of the competition. I’ve observed all these trends in the last few years. The fourth has the starkest data. 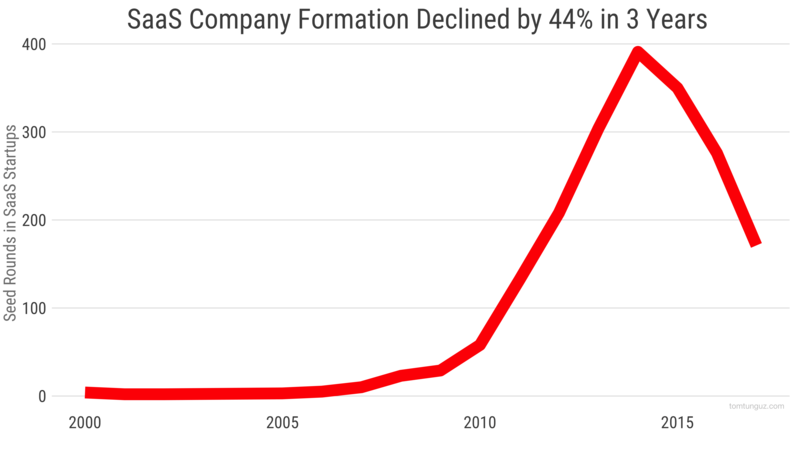 SaaS company formation has fallen by 44% in the last 3 years. I’m using SaaS seed rounds as a proxy metric. I believe competition is a major driving force, especially since venture capital is conspicuously copious. The table stakes in SaaS are rising. But it’s not the MRR milestones or the payback period benchmarks that have changed. They may have increased slightly. Instead, the competitive differentiation ante is much greater. Hawking a SaaS version of a client/server software has been played out, and many buyers will be approached by a collection of competitors with seemingly indistinguishable offerings. Machine learning, broad consolidation, category creation, and new distribution models each will change the SaaS ecosystem in fundamental ways. As the number of new startups ebbs, and major forces in the industry reshape it, I suspect we’re going to see a massive amount of innovation in SaaS, a reinvention after the perfection of a 20 year old playbook.